I’m glad to inform you that next upcoming build (open beta), that will be available for download very soon, is already compatible with the latest 4.5 release of Prepar3d, (obviously free of charge for 64bit edition customers). We have just begun diving inside the new 4.5 features, and you can expect Fly the Maddog X being one of the first products in the market taking full advantage of the new features, with a dedicated 4.5 release. The present version (SP1b352) is officially compatible with P3D 4.2/4.3/4.4 only, we have not tested it in 4.5 and we won’t give any support for that. My suggestion is to wait just a couple of days for the new installers. But let’s talk about the new features coming with the next build. 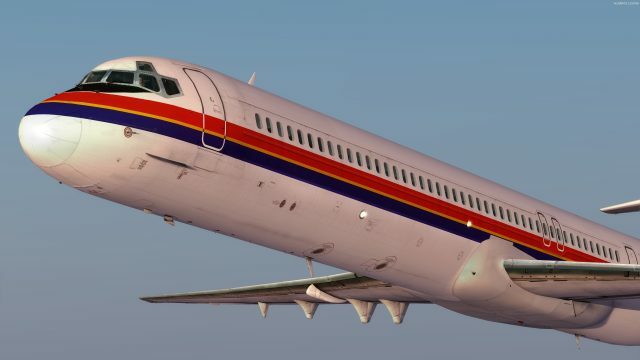 As already stated, among the new added features there is the simulation of the ACARS system, and the addition of the full PBR virtual cockpit (you’ll be able to enable/disable it in the same way PBR for the external model works). Stay tuned, release is close.